35mm Slide Film is mounted in a 2"x2" mount. The film size is 35mm x 23mm or 1 3/8" x 15/16". Slightly larger film surface than the traditional 35mm slide, this slide is mounted in a 2"x2" mount. The film size is 35mm x 28mm or 1 3/8" x 15/16". 126 Format Slides are in a 2x2 mount. The film shape is square. 28mm x 28mm or 1 1/16" x 1 1/16". If you have 126 film, but it is not in a slide mount, then you have a 126 Negative. 110 Format Slide Film is mounted in a 2"x2" mount but has a small film surface. The film size is 17mm x 13xmm or 11/16" x 1/2". If your 110 is not in a mount, then you have a 110 Negative. 127 Format Slide Film is mounted in a 2"x2" mount. The film size is 30mm x 30mm or 1 3/16" x 1 3/16". 127 Format Super Slide Film is mounted in a 2"x2" mount. 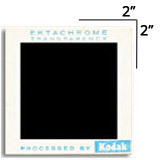 The film size is 38mm x 38mm or 1 1/2" x 1 1/2". A stereo slide was originally meant to be a 3-D slide, so the same image is mounted twice in the same mount. We will only scan one of the images and you will only be billed for one image. If you want both images, just let us know and you will be billed twice for each stereo slide we scan. The image that we scan will NOT be in 3-D.
A Medium Format Slide is in a cardboard mount and the film size is 53mm x 53mm or 2 1/8" x 2 1/8" or larger, up to 3.75".